This could be a failing pump, leaking bag, a bad sensor or corroded/shorted wiring or connector. V8 front wheel drive automatic 60,555 miles. I get a "check ride control" error on start up. I hear the compressor run for about five seconds then stops at that time error appears. You will need to have the air ride system scanned for the error code, it will tell you where to begin. I have a 1997 Continental which only has the air ride suspension in the rear. The rubber air ride bags will dry rot after a while and leak air. After the compressor tries to fill the air ride bags and fails to do so it will give you an error. I replaced the air bags with springs which I bought on-line from Strut Masters for about $200.00. You can replace the air bags yourself or have a garage do it for around $200.00 and you will never have to worry about the air ride system again. My ride is actually better with the springs than with the air ride system. All that is true, if the air springs are the problem. If it is just a solenoid, $400.00 is a tad expensive! The air ride bags are only rated for four to five years of service and then are recommended to be replaced because of dry rot. The compressor and air dryer should also be replaced because of blow by from the compressor cylinder ring wearing out, think of all the times the compressor has to run over a four to five year time. You can replace the air ride bags for about $120.00 each, the compressor and air dryer will cost in the $150.00 range also. If you replace the air ride system it will cost in the $390.00 range and then if you are not handy you will have to pay a mechanic to replace the components also which is more expensive than the spring option. If it is really just the solenoid valves, in one or two years you will have to replace the air bags anyway. Would not the $200.00 springs and the $200.00 mechanic installation be cheaper over the long haul when you would not have to ever worry about the suspension system again? My "Check Ride Control" warning is coming on. The air suspension system is not airing up consistently. I can hear the compressor working, but at times the rear suspension does not inflate. Sometimes if I restart the car, the system will engage, but not this morning. This has been going on for the last week. What am I facing. That could be a leak in the system somewhere or even a bad compressor. You need to get it resolved ASAP because it will burn out the compressor in the meantime if you don't. 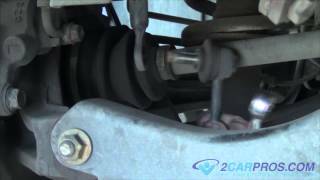 What happens in these cars is the front and rear shocks and struts end up leaking which causes the compressor to run continuously. I would check out the shocks by spraying them down with soapy water to see if they will blow bubbles so you can confirm the failure. I have a 95 Lincoln continental and the air ride is not leveling out . The passenger front is out of air and the compressor is good, there are no leaks in the bags, and the "check ride control ", light is on. The compressor is not coming on and the compressor does work if I put power to it. I'd like to know if you have any suggestions on what it could be? Disconnect air compressor relay 4-pin connector. Relay is located front center of engine compartment. Check connector for corrosion, bent pins and damaged wires. Repair as necessary and repeat ON-DEMAND SELF-TEST and PNEUMATIC TEST. If connector is okay, go to next step. Connect a jumper wire between Light Blue/Pink wire and Purple/Orange wire at relay connector. If compressor does not run, remove jumper wire and go to next step. 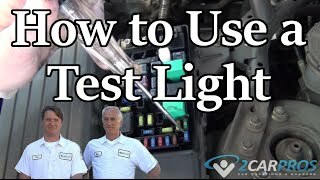 If compressor runs, go to PINPOINT TEST Q and then to PINPOINT TEST R.
Measure voltage between ground and Light Blue/Pink wire at relay connector. If battery voltage is present, go to next step. If battery voltage is not present, go to step 7). Disconnect air compressor connector. See Fig. 1 . Check continuity of Purple/Orange wire between relay connector and air compressor connector. If continuity exists, go to next step. If continuity does not exist, repair open in Purple/Orange wire. Repeat ON-DEMAND SELF-TEST and PNEUMATIC TEST. Measure resistance between ground and Black wire at air compressor connector. If resistance is less than 3 ohms, go to next step. If resistance is 3 ohms or more, repair open in Black wire between ground and compressor connector. Repeat ON-DEMAND SELF-TEST and PNEUMATIC TEST. Connect a jumper wire between positive battery terminal and Purple/Orange wire at air compressor connector. Connect another jumper wire between negative battery terminal and Black wire at air compressor connector. If compressor runs, no problem is indicated at this time. Repeat ON-DEMAND SELF-TEST and PNEUMATIC TEST. If compressor does not run, replace compressor. Repeat ON-DEMAND SELF-TEST and PNEUMATIC TEST. Remove and inspect No. 3 (60-amp) fuse from power distribution center, on left side of engine compartment. If fuse is okay, repair open Light Blue/Pink wire between power distribution center and air compressor relay. Repeat ON-DEMAND SELF-TEST and PNEUMATIC TEST. If fuse is blown, go to next step. Disconnect air compressor connector. See Fig. 1 . Measure resistance between ground and Purple/Orange wire at air compressor connector. If resistance is 10,000 ohms or more, go to next step. If resistance is less than 10,000 ohms, repair short to ground in Purple/Orange wire between power distribution center and air compressor connector. Replace fuse and repeat ON-DEMAND SELF-TEST and PNEUMATIC TEST. Measure resistance between ground and Gray wire at air compressor connector. If resistance is less than 3 ohms, go to next step. If resistance is 3 ohms or more, repair open in Gray wire between ground and air compressor connector. Repeat ON-DEMAND SELF-TEST and PNEUMATIC TEST. Disconnect air line from air compressor and air spring solenoid. Connect a vacuum pump to one end of disconnected line. Apply vacuum. If vacuum does not hold, reconnect line and go to next step. If vacuum holds, service pinched or obstructed air line as necessary. Repeat ON-DEMAND SELF-TEST and PNEUMATIC TEST. Install pressure gauge in air compressor drier air line port. With solenoid still on, command COMPRESSOR: ON and observe pressure gauge. If pressure reaches a minimum of 150 psi, go to next step. If pressure does not reach 150 psi, replace compressor assembly. Repeat ON-DEMAND SELF-TEST and PNEUMATIC TEST. With air pressure at a minimum of 150 psi, command COMPRESSOR: OFF and observe pressure gauge. If pressure holds, no problem is indicated at this time. Repeat ON-DEMAND SELF-TEST and PNEUMATIC TEST. If pressure leaks down, replace compressor drier assembly. Repeat ON-DEMAND SELF-TEST and PNEUMATIC TEST. Thanks for the info I did have another question. We have a light on states "Door Adjar" however I checked all the door switches and they are okay and the doors are shut however the interior light will not go off. Any ideas what this could be? Up until a few months ago I found myself in the rare position of having an aging 90's Lincoln with a perfectly functioning rear air-suspension system and perfect boulevard ride. The car has previously suffered one of the Continental's signature problems; the front drivers side spring sheared itself in half tearing up a tire and mangling the ride height sensor, but this was repaired and that's neither here nor there. But the rear air struts have never had a problem in the past three years I have owned the vehicle other than it being very badly rusted (It's spent it's whole life in Wisconsin and Illinois). The problem with the air ride started a few months ago when the battery went and I had to replace it. I wasn't thinking it through all the way at the time I suppose, because I decided to replace the battery myself. In a car from a time when one of the key facets of a luxury car was having computer control over everything. After I replaced the battery the vehicle has developed a habit of deflating all the way down to resting on it's wheels over the course of about an hour after it has been turned off. It is a fairly reliable problem that seems to have gotten progressively worse. It used to be once every four or five times driving the car, now it is about every other time that this happens. I do seem to have some control over it. If I leave the car running, in park, for about a minute after I have stopped in the garage or parking space it increases the likelihood that air will stay in the suspension. I can also, seemingly, prevent it from happening if I park, leave the engine running, and go to the trunk and manually shut off the load leveling suspension before turning off the engine. Also, there are instances in which I will arrive home around 5 or 6 at night and the suspension will still be inflated when I go to bed around 11 or midnight, but by the next morning the car again will be all the way down resting on the suspension stops. I suspect that there is something wrong with the valve solenoids actuating and releasing air from the system. Is it possible that the suspension computer was confused when I swapped the battery and the solenoids are defaulting open rather than closed when the vehicle is turned off? Once I start the car and it jacks itself back up off the ground, it works perfectly. The compressor never runs again after the initial re-pressurizing of the system, and there is a noticeable difference between plush, normal, and firm modes in the computer control. (Although I will say the chances of the car staying up after being shut off are significantly higher if the car has been in normal mode than plush mode. Problem being that I like the plush mode, my father is the only one who uses normal on the rare occasion he drives the car). I don't really have the facilities to jack up the car and spray soapy water on everything to see where the air is coming from, and the last time I had the car into the Ford dealer there wasn't a technician there old enough to have even the slightest clue about old Lincolns with air-ride suspensions. They were looking at me like I had two heads in fact, unfortunately. Other than being cosmetically shot and having a check engine light for a bad gas cap, the car is mechanically perfect and this is the only problem which has really serious implications. I'd really rather not burn out my air compressor for obvious reasons and this car has to last for another year or two before I can let it go. This can be a couple of things, a bad vent solenoid or one of them on the struts, an air leak, bad struts etc. It should really be scanned for codes though.